This week, NOAA’s Office of Response and Restoration is highlighting the importance of disaster preparedness. Follow us this week as we take a look at how NOAA prepares for natural and human-made disasters, and how you can prepare for the 2018 hurricane season. Share your #DisasterPreparedness strategy by commenting on our blog, or replying to our Twitter and Facebook. Being ready for natural disasters is all about learning from the past, looking ahead to the future, and preparing in the now. Preparedness is not a one time effort. Disasters happen every year, and it’s important to make sure you’re ready — not just once, but throughout the year. Natural disasters can take you off guard, if you let them. In all reality, natural disasters are not a complete surprise. They happen every year, and for some, we even have a general timeframe for when we might expect them — such as hurricane season. That knowledge affords us the incredible opportunity to be ready and prepared when the time comes. Preparedness saves lives, it saves property, and it even saves the environment. Here at NOAA’s Office of Response and Restoration, we have preparedness plans for all manner of possible incidents — ranging from natural to human-made disasters. This week, we’ll be sharing with you what we do to stay prepared, and we’ll even have some tips for how you can be prepared, too. We all know that hindsight is 20/20, so why not use the past as a resource in planning for the future? By examining incidents and disasters that have happened before, we can learn from our experiences as well as the experiences of others. Glancing back at last year, the 2017 hurricane season had only a fifth the lost of life of past seasons. This is an excellent example of learning from the past, as this number has been largely attributed to improved forecasts and warnings. Though the loss of life was far less, the physical damage was twice that of previous years. NOAA contributed more than 2,000 hours of collective on-scene support during last season’s hurricane response. OR&R, as part of the Hurricane Maria emergency Support Function #10 (ESF-10) team, helped with the vessel removal operations, primarily in Puerto Rico and the U.S. Virgin Islands. In the U.S. Virgin Island, ESF-10 mitigated the pollution risks from a total of 480 displaced vessels, 3,668 hazardous chemical containers, and 309 batteries. A total of 12,449 gallons of fuel and oil waste was recovered. A total of 400 coral colonies were relocated. In Puerto Rico, 377 sunken or beached vessels were reported. ESF-10 oversaw the removal of 260 vessels, contacted vessel owners, mitigated 37 pollution incidents, and removed 17,800 gallons of oily water. During a crisis, human life is of course the priority of any response. When creating a preparedness plan, it’s important to also consider the environmental concerns associated with a disaster — including ways to mitigate potential pollution incidents in your home and on your property. When planning ahead for any given year, it’s important to pay close attention to the forecasts and other resources that are available. 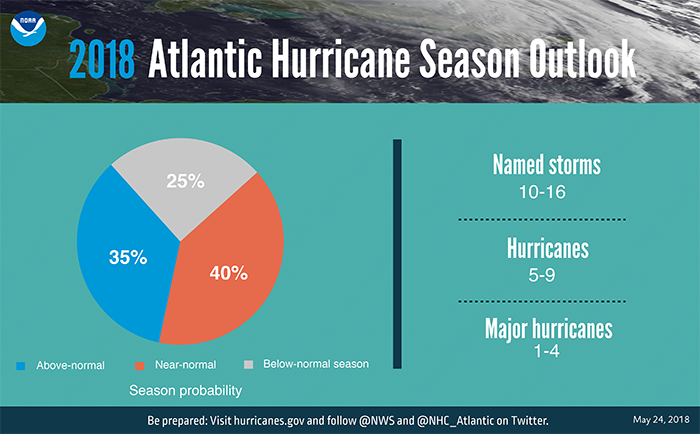 According to NOAA’s forecasters, a near- or above-normal 2018 Atlantic hurricane season is expected. The Atlantic hurricane season, which extends from June 1 to November 30, is expected to have a 70 percent likelihood of 10 to 16 named storms (those with winds of 39 mph or higher). Of those, five to nine could become hurricanes — storms with winds of 74 mph or higher — including between one and four major hurricanes of a category 3, 4, or 5 and with winds of 111 mph or higher. NOAA has also issued seasonal hurricane outlooks for the eastern and central Pacific basins. An 80 percent chance of a near- or above-normal season is predicted for both the eastern and central Pacific regions. The eastern Pacific outlook calls for a 70-percent probability of 14 to 20 named storms, of which seven to 12 are expected to become hurricanes, including three to seven major hurricanes. The central Pacific outlook calls for a 70-percent probability of three to six tropical cyclones, which includes tropical depressions, tropical storms and hurricanes. An updated 2018 Atlantic seasonal outlook will be published in early August, just prior to the peak of the season. For more information on seasonal outlooks, stay tuned for tomorrow’s guest blog from the National Hurricane Center. 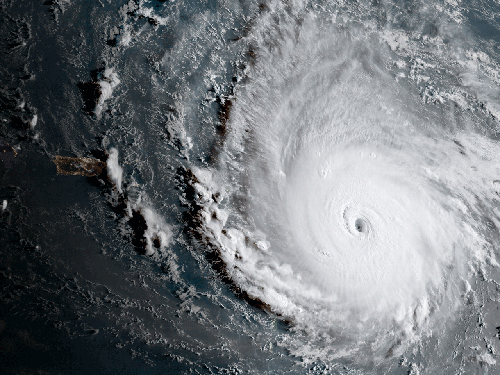 Hurricane Irma, which made landfall in early September 2017, was one of the strongest storms to impact the Caribbean and U.S. in history. Image credit: NOAA. OR&R prepares for disasters year-round through trainings and updating plans and response resources. NOAA’s Gulf of Mexico Disaster Response Center (DRC) was established to expand the federal capacity to plan for and respond to hazards of all types — bringing together NOAA-wide resources to improve preparedness, planning, and response capacity for natural and human-caused disasters along the Gulf coast. Dedicated in 2012, the DRC has since become the bedrock for NOAA’s new Disaster Preparedness Program — a program to build on the DRC’s existing operational capabilities and knowledge to ensure that commerce, communities, and natural resources can recover from disasters as quickly as possible. OR&R’s scientific support coordinators provide training for responders throughout the year, and participate in local area committees, regional response teams, and geographic response teams. Part of training and planning to protect life, property, and the environment, is knowing what there is to protect. By creating area contingency plans, responders can identify areas with sensitive habitats and provide protection strategies to assist with future responses. In Puerto Rico and the U.S. Virgin Islands last year, more than 15,000 corals at over 50 sites were reattached. That’s why it’s important to have job aids and plans in place for how to deal with sensitive habitats, such as mangroves, marshes, and coral. Part of the training that is provided includes how to respond to a pollution-disaster based on the type of habitat that was impacted, resources at risk (including sensitive habitats and listed species), and the type of product that is causing the threat to natural resources. OR&R also provides reference materials, such as the Environmental Sensitivity Index (ESI), which provides summaries of coastal resources that are at risk if a pollution threat occurs. ESI maps identify the types of shoreline that are in an area, establish protection priorities based on the sensitivity of a habitat, and help to identify cleanup strategies. Updated ESI maps can provide responders with very current and relevant information to develop protection strategies before a product comes ashore or develop cleanup strategies that are appropriate for that particular area. Part of preparing for the next hurricane season is repairing the damage from the previous season. Mangroves and marshes provide shoreline stabilization and can act as the first line of defense against hurricanes and other natural disasters. Restoring shorelines damaged by hurricanes is one way NOAA helps to prepare for future disasters — similar to how you should repair and fortify your house if it was damaged in a hurricane. Are you ready for the 2018 hurricane season? Stay tuned this week for more information on OR&R’s preparedness efforts, as well as preparedness tips and resources you can use to get prepared for this year’s hurricane season.